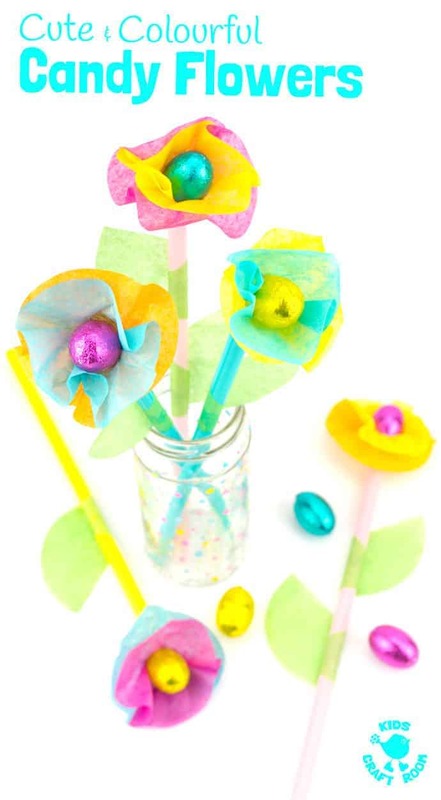 Your kids are going to love this Candy and Tissue Paper Flower Craft. 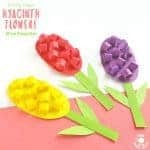 These homemade flowers are so simple to make yet so pretty and in the centre of each one is a delicious piece of candy! 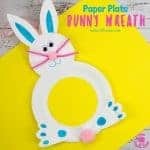 This easy flower craft makes a gorgeous table centre piece and is fabulous for homemade gifts too. 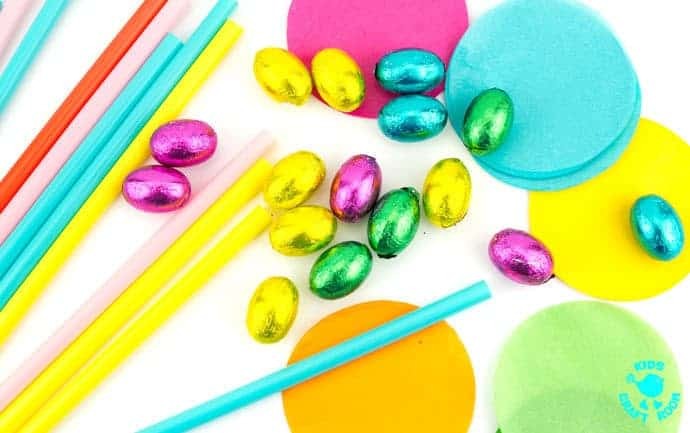 We’ve made our chocolate flower bouquet using mini eggs for a fun (and tasty) Easter craft but this easy flower craft idea would work just as well at any time of the year using your favourite or seasonal wrapped candy. 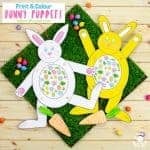 How about a bunch of Easter candy flowers, a Hershey’s Kisses flower bouquet for Valentine’s Day or a delicious Chocolate flower bouquet for Mother’s Day using mum’s favourites? 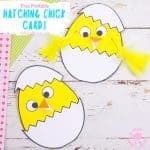 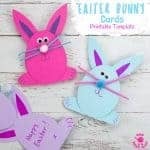 While your here don’t forget to take a peek at our other popular Easter crafts too. 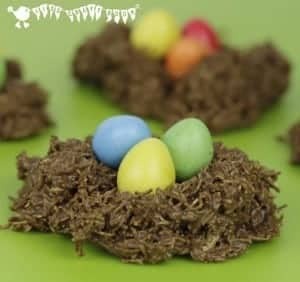 Another fun way to use mini eggs is this easy Easter Nest Recipe. 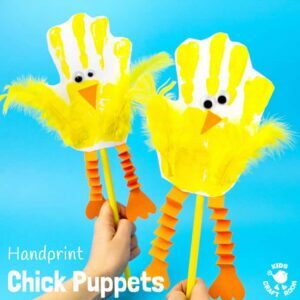 Our cute Handprint Chick Puppets are loads of fun for imaginative play and every Easter needs a cute Easter Bunny Craft. 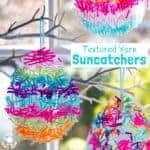 Regular readers will have heard me admit to being a bit of a craft supplies collector and hoarder, I just can’t help myself! 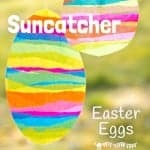 It’s like telling a mouse to stay away from the cheese, it just isn’t going to happen! 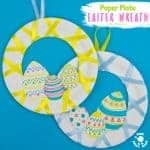 These gorgeous round tissue paper sheets have been in my craft cupboard for over a year…waiting for the right idea to emerge…and this lovely candy and tissue paper flower craft was it! 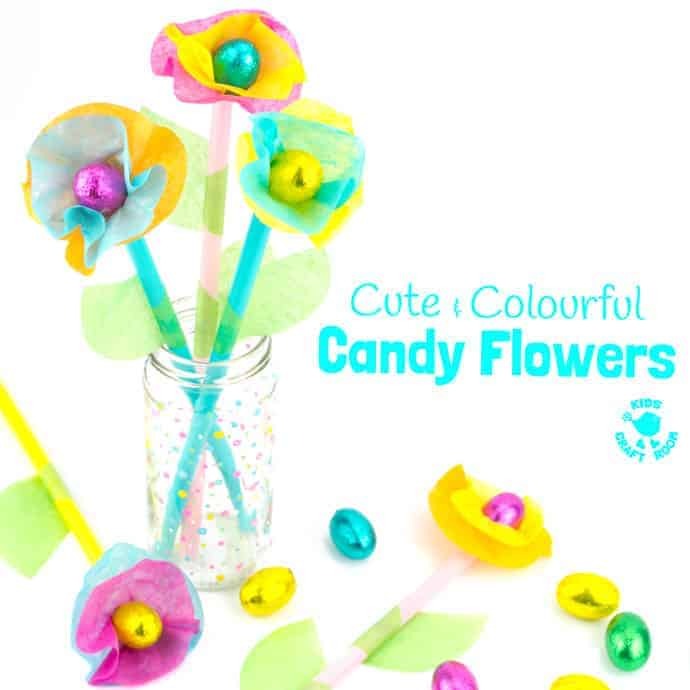 I just adore how easy these flowers are to make and how colourful and cute they are! 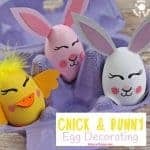 We nipped to our local store and picked up some foil wrapped chocolate mini eggs to make our Easter flowers. 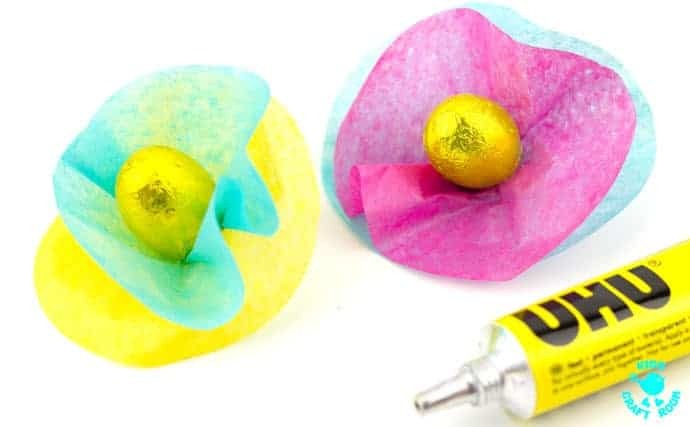 If you want to make this tissue paper flower craft at another time of year then you can try with any other small foil wrapped candy you fancy. 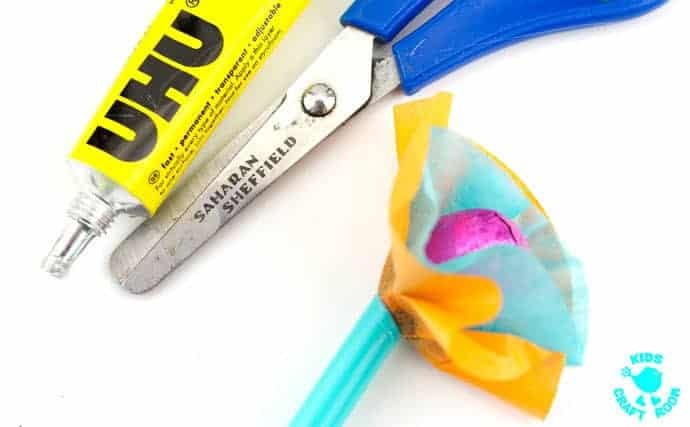 Start your flower craft by adding a dab of glue in the centre of a tissue paper circle and wrap it around the end of your candy. 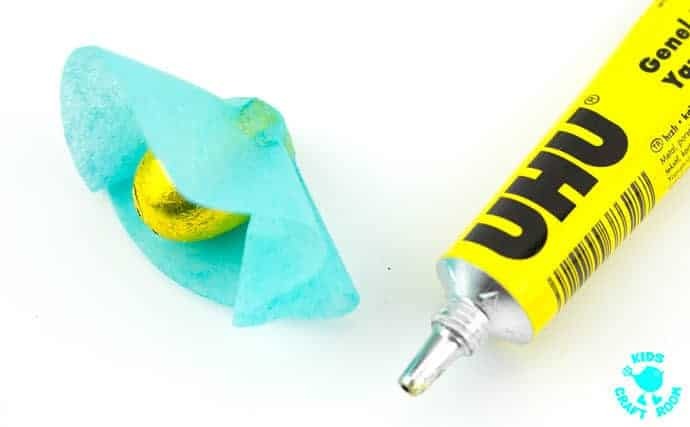 UHU glue worked really well for us, but you could try with a glue gun if you prefer. 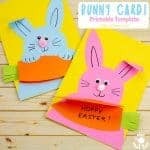 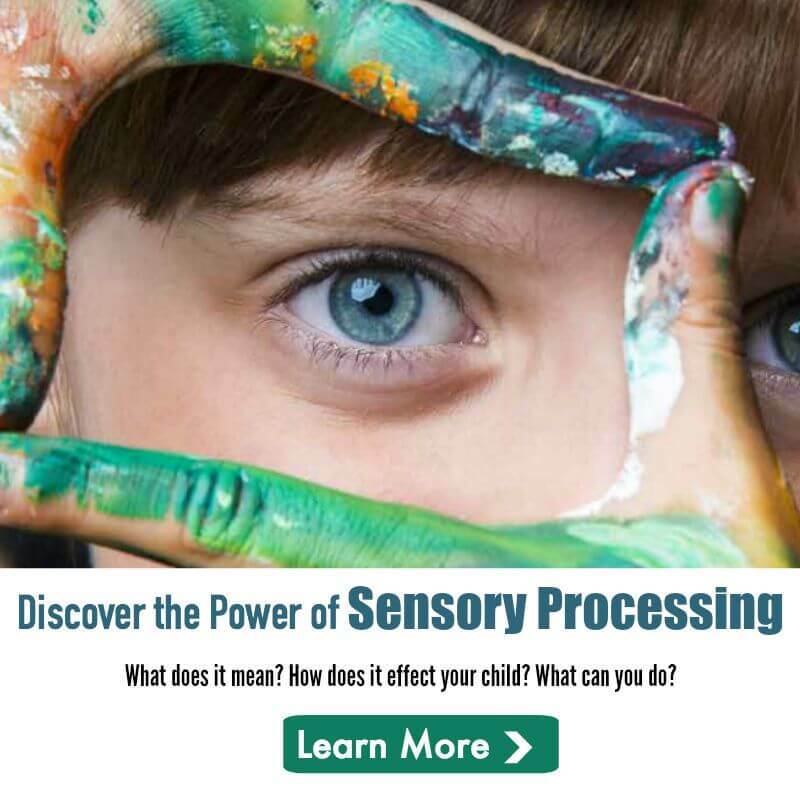 Just make sure there is no way for the glue to come in contact with the actual candy and make sure children know not to eat the glue or tissue! 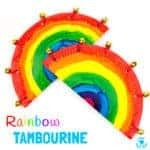 We added two layers of petals but you could add more if you fancy. 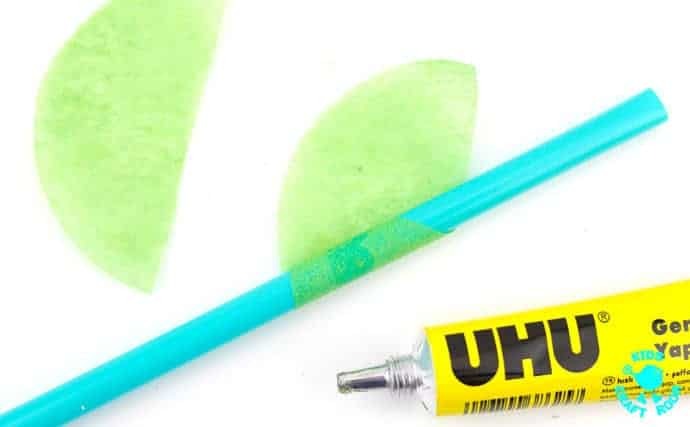 To make the stems and leaves for our tissue paper flower craft we cut some green tissue circles in half and light wrapped and glued one end around a wide jumbo straw. 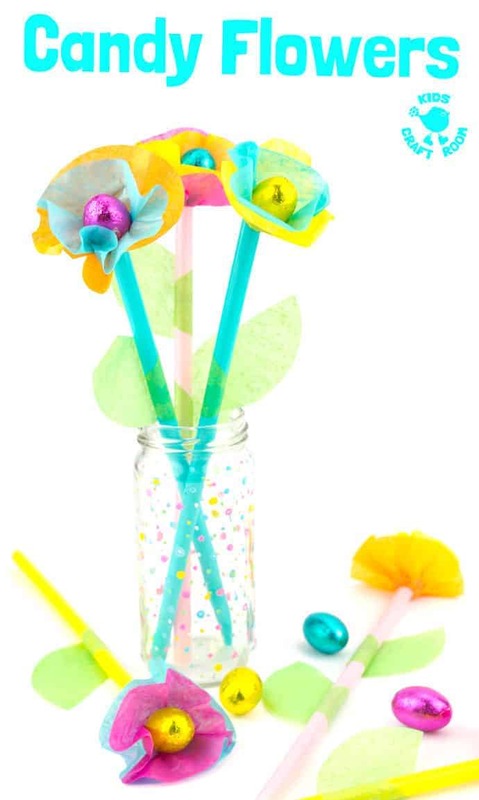 To help our flowers point outwards to create a pretty bouquet we snipped off the end of the extra wide jumbo straw at a slight angle and glued our flower head in place. 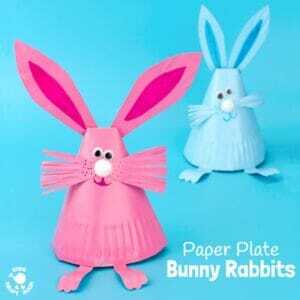 This candy and tissue paper flower craft is so cute, don’t you think. 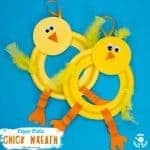 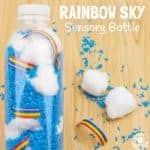 They’d make a lovely centre piece for a party or special event and of course would be a super cute homemade gift to give to friends and loved ones.